Heidenkind: Hello, Mr. Turner. Thank you for agreeing to do this interview with me! JMW Turner: 'Allo, luv. Don' be gushing too pre'y now, no' many people wot's wanting ta sit down wif brown bread fo'ks leik me. JMWT: Bill, me Cadbury, Bill! H: Bill, you're considered the greatest British painter who has ever lived. Is that what you set out to accomplish with your work? Bill: I woul'n' say I se' ou' ta accomplish it, no, alvough I am fin'in' i' a bi' gra'ifyin' tha' you're sayin' so. I's simply tryin' to pain' wot I sees--in me loaf an' in me strawberry. H: Oookay. How about your critics? 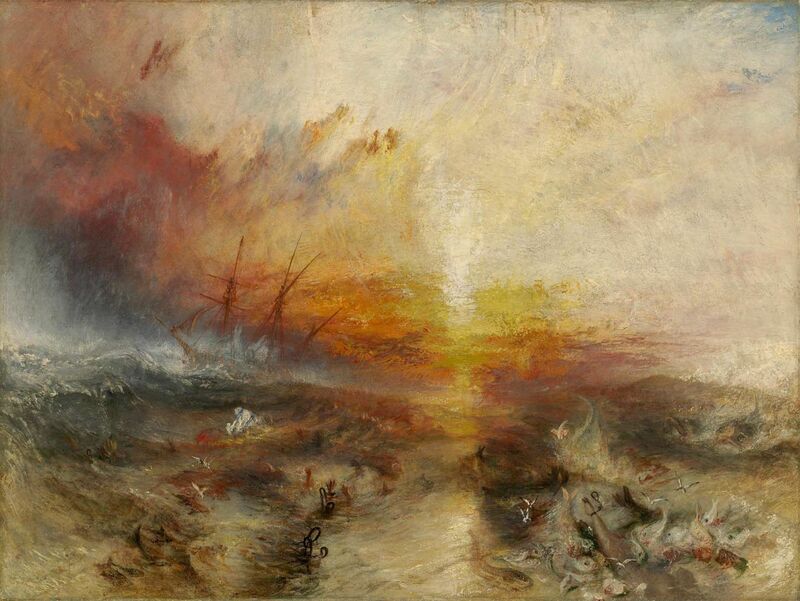 One said Slave Ship, which Simon Schama called the greatest British painting ever, looked like a kitchen accident. Bill: *laughs* Luv, if I lis'nd ta fose cab rankers, I woul' been a boa'man on fe Thames! Cri'ics ain' nuffin'. Bu' who is vis Simon Schama China, fen? H: He's a historian who likes to pretend he knows stuff about art, then makes crappy television shows about it. Bill: Can' be too "crappy," seein' as 'ow ya knows abou' 'em. H: I guess. You also wrote a poem to accompany Slave Ship and many of your other works. *clever book blog tie-in* Do you think they help people understand your paintings better? Bill: We Cockneys do enjoy a gran' rhyme.... I woul'n' no' a'mi' ta li'era'y ambitions, bu' even I 'afe ta a'mit me poems were nuffin' bu' a pale reflection of me pain'in's. An' fey neva be 'elpin' anyone un'erstan' 'em when I wars alife. H: Your work inspired the French Impressionist Claude Monet and arguably led to modern art. Do you have an opinion on any modern artists? Bill: Monet can kiss me Aris! D'ye see fa' pain'in' 'e di'--Impression, Sunrise? Wot a tea leaf! I pain'ed work be'er fan tha' in me sleep! An' exac'ly like, too. H: I know, it's eerily similar to The Fighting Téméraire, among other works. But what do you think of other modern artists? Bill: I fink when one's an ar'ist, one ha' be'er follow 'is own vision--no' tha' ov cri'ics or family or fellow ar'ists. uverwise, 'e risks losin' 'is chinese. *taps head* Vere wore times when I fough' meself goin' the way o' me mum--bu' the work always saved me. An' makin' no mistake, pain'ing is work, a craf' an' a discipline. I can' tell ya 'ow many times a pride an' joy 'as asked me fo' a'vice on 'is ar', wi'ou' a mark on 'is lilly-whi'e 'ands. Tha' ain' an ar'ist. Ar' 'as no room fo' vani'y or cleanliness--i' takes ye by your nanny an' don' le' ye go. H: Is that why you've been connected to several women, but never married any of them? Bill: Ah, ducky, I ne'er tawk abou' me ladies! Fey were nice rolls in the 'ay, nice to 'afe aroun', bu' me passion was always pain'ing. When fey's go' too deman'in', fey'd 'afe ta go. An ar'ist--a grea' ar'ist--lives an' breaves 'is ar'. Like Raphael--ne'er allow a woman ta be ya weakness! H: Thank you so much for the interview, Bill. I can't tell you how much I admire your work. Bill: Any time a'tall, lovey. Who Is the YA Audience?